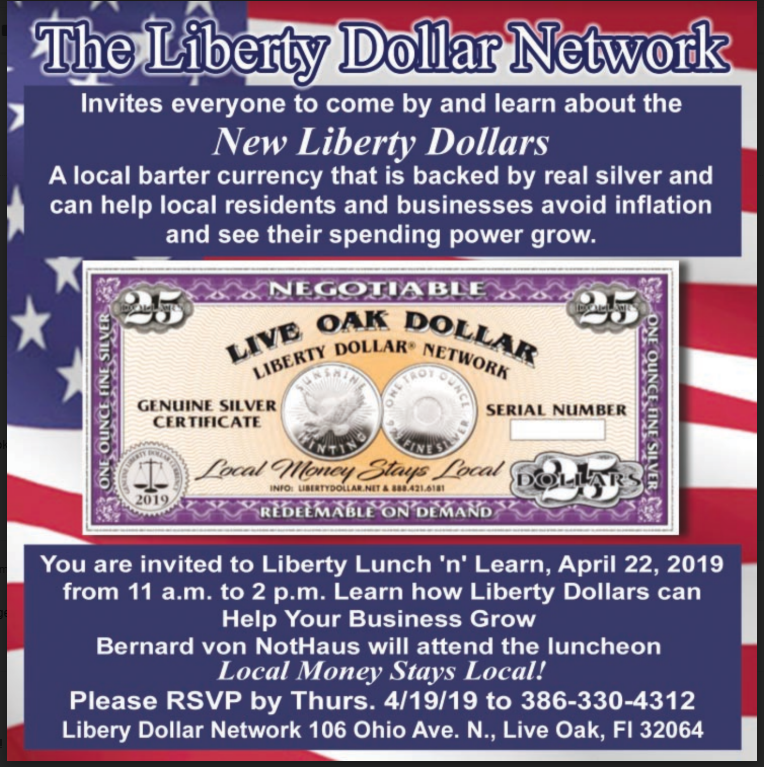 The Liberty Dollar Network is dedicated to using the security of a value-backed currency to help both local communities and people everywhere prosper, by preserving the spending power of their money and working to keep more community wealth circulating within the local economy. To accomplish this, we are emulating the Liberty Dollar that enjoyed tremendous success in the early part of the 21st century, by presenting a currency that can be legally used in barter and is backed by .999 fine silver. This currency consists of Silver Certificates that are defined as Warehouse Receipts for a specific amount of silver stored in our facility or one that we are contracted with. 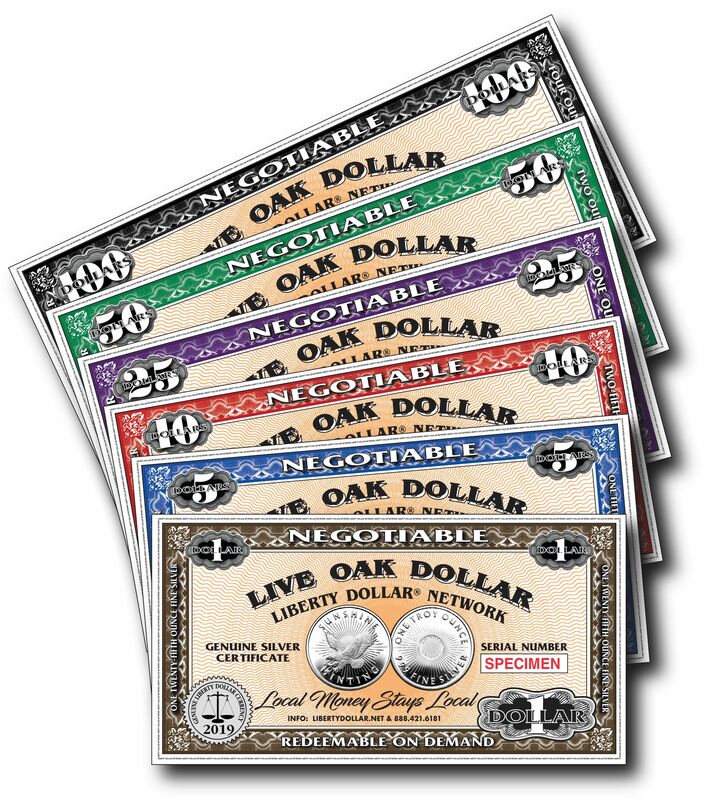 The silver is available to the bearer of these certificates on demand, but the real value in Liberty Dollars comes from using them within your community. They are brightly colored and of different sizes, so they can't be mistaken for US dollars. Liberty Dollars can be branded for any community, but they are not limited to use in a certain location. This is because, no matter where they might be traded, the new owner can still redeem the silver at any time. All it takes is a visit to our Redemption page on this website. Our goal is to eventually have Liberty Dollars branded for communities all over the country, and even in other countries. Regardless of where they might be used, they are always going to be backed up by silver, so the value is always going to be there. We currently base the currency at $25 USD per ounce, so each ounce of silver you purchase gets you $25 worth of currency. You can get the silver at a 10% discount, so you actually gain spending power by using it, and Merchants who accept it can also profit from its use. We also offer a digital version of the currency, for use online. Electronic Liberty Dollars (eLD) can be converted to Silver Certificates at any time for use offline, as well, and we will soon offer smartphone apps that will let you use it anywhere. An added benefit is that Liberty Dollars are not as easily devalued by inflation, since the price of silver rises along with prices for everything else. When the price of silver goes up, so will our Base, and then your Silver Certificates can be exchanged for new ones of higher value. That way, you don’t lose spending power from inflation like you do with other kinds of money. Please read through the website and learn more about Liberty Dollars, and how they can help you and your community to prosper. You can join the Network for free and start taking advantage of the Power of Silver today.